How should you navigate these options? Where should you go? What is arts month? What is art? Follow this guide to find out. After a day of engaging with art theory at The Nasher for a symposium inspired by Nasher Prize Laureate Theaster Gates, what better way to celebrate is there than to look at some art? You can, at the opening of Beatriz Esguerra Art pop-up space from 6-10 p.m. in the Design District. BEA is a gallery based in Bogota, Colombia and they’ll feature works by Fernando Botero, large-scale sculpture by artists Hugo Zapata and Ricardo Cardenas, and work by noted painter Pedro Ruiz in dialogue with three other gallery artists. The store stays open until April 21st. Also in the Design District: an interior design-focused opening atRoche Bobois featuring a collaboration with Jen Maudlin Gallery. Maudlin represents several talented Dallas-based artists including Courtney Miles, Kelly Clemons, and Bang Dang who will have work in the show, which runs from 5-8 p.m. Finally, galerie frank elbaz opens Jay DeFeo (1929 -1989), an exhibition of 40 works on paper from the 1970s by the Bay Area native. That’s from 6-8:30 p.m.
Dallas’ new SP/N gallery curated by Marilyn Waligore offers another stellar opportunity to experience the depth and breadth of work being created by women and female-identifying artists in North Texas. Women’s Work features must-see artists Chesley Antoinette and Rachel Muldez, and Colette Copeland will be debuting the final installment of her The Victorian Woman and The MAN series, titled Bearding. Jessie Budd, Courtney Nicole, Victoria Oliva, and Libby Rowe round out the show, which opens with a reception from 6-8:30 p.m.
Anton Kern Gallery (New York) and Harlan Levey Projects (Brussels) Pop Up Reception is tonight only from 5-8 p.m. Artists include JR Ericsson, who has work at the Dallas Museum of Art, and Emmanuel Van der Auwera, who will show at the Dallas Contemporary next January. The Deep Ellum Arts Festival fills the neighborhood with art and music and even more people, in an entertainment district that’s always crowded now. This year the festival reached out to local galleries—Elevate Dallas, Ash Studios (I’m a co-founder), WAAS Gallery, Kettle Art, and FGIII Fine Arts Productions are all in the mix— to add some contemporary flair to the visual art openings. It will be interesting to see if the art gets drowned out by the noise of the festival. One installation that certainly won’t be missed is by Ben Lewis, who will display his treasure trove of mannequins and other window display items he’s been collecting since 2003. As part of Dallas Arts Month, four cultural centers of the City of Dallas’ Office of Cultural Affairs will host the Art 214 Juried Exhibition Opening from 5-7 p.m. If you want to find new artists who are making work in Dallas, go to this show. It appears there’s bunch of talent to be found in the city— apparently over 750 people applied— and I can’t wait to see who is going to be part of the next wave of artists who will bring us all forward. Standouts like Chesley Williams, Paxton Maroney, and Kaila Parrish are included in the exhibtion. The jurors were Elizabeth Mellott, Tori Phillips, Jim Burton and Arthur Peña, and the show is curated by Christina Estrella Riggs. One of the most anticipated openings is Francisco Moreno’s The Chapel at Erin Cluley Gallery. Moreno has always had a knack for tackling large scale, ambitious projects, and this is no exception. 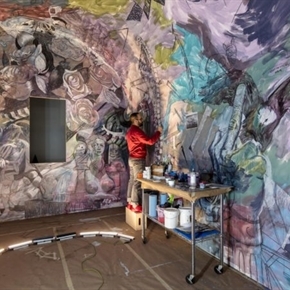 The large-scale painting is based on the barrel-vaulted structure of Spanish Romanesque mural paintings from the Hermitage of la Vera Cruz installed at the Prado in Madrid. Over at Galleri Urbane, one can find the triumphant return of Samantha McCurdy with a solo show called Personal Boundaries. McCurdy founded the influential art space That That in Dallas before relocating the project and her practice to Los Angeles. In addition to her shaped paintings, the artist will perform with a contribution from Ryan Lynch, promptly at 7:30 p.m. Kristin Skees will also present photographs of relatives and friends obscured by hand-knit sweaters, in a solo show. Conduit Gallery has solo shows by two of their heavyweights, Kirk Hayes and Annabel Dao. Hayes is known for his mastery of trompe-l’oeil paintings, and Dao continues her experiments around fragmented languages communicated through wire, resin, and repair tape that form empty vessels. Rounding out the show is work by L.A.-based sculptor Roberto Benavidez. Jen Rose will be showcasing biomorphic porcelain sculptures at Carneal Simmons, Nathan Green will be included in a group show at Barry Whistler, and Maysey Craddock will show works on found paper at Cris Worley from 5-8 p.m.
Ro2 will close a stellar group show, The Women of Ro2, at their pop-up location on Commerce downtown. Alaena Hostetter has all you need to know on that exhibition and what’s coming up from R02. Eric Fishl speaks from 1-2:30 p.m. at the Dallas Contemporary on his upcoming exhibition If Art Could Talk before it opens Wednesday. Director Peter Doroshenko moderates. Later in the day Bath House Cultural Center hosts the next opening for the Art 214 exhibition from 5 p.m. to 7 p.m.
It’s also a great day to swing by the Deep Ellum Arts Festivalbefore it closes. You know it is officially Arts Week— expanded to Arts Month— when its original founder Mayor Mike Rawlings gathers people to talk about art. These conversations have come a long way— remember the era when there were no women panelists?— and this year is an interesting selection of placemakers, developers, and directors of small and mid-size arts organizations. Kelley Lindquist, President of Artspace; Lola Lott, Principal & CEO of Charlieuniformtango & Co-Founder of Arts Mission Oak Cliff; Kimi Nikaidoh, Artistic Director of Bruce Wood Dance Project, and Michael Tregoning, President of Headington Companies will be the panelists for Creative Conversation: Dallas Cultural Plan, moderated by Michael Granberry, Arts Writer for The Dallas Morning News. The evening will start with an update on the Dallas Cultural Plan by Joy Bailey Bryant from Lord Cultural Resources and some remarks by the mayor himself. It all happens at Moody Performance Hall from 6-8 p.m. You can register here. From Bern, Switzerland, visiting artist-in-residence Manuel Burgener opens FRAGMENTS at SITE131 from 5-8 p.m. During his weeklong stay, Burgener will build elegant large-scaled, open constructions from found industrial materials. The artist will be joined by Kelly Kroener, who tools her marks with embroidered stitches on fabric. German abstract artist Travis Lycar will show his oversized canvases of jagged, halting painted marks, and mysterious California artist Puppies Puppies surprises with isolated triggers from destroyed firearms. The Power Station has typically hosted the only opening on Wednesday evening, but this year must share the spotlight with Site 131 and the Dallas Contemporary. This year they offer up The Grey Room by Aaron Gordon from 7 to 9 p.m.
Close the night out at the Dallas Contemporary as three shows open with a reception from 7-10 p.m.: Eric Fischl, Harry Nuriev, and Sara Rahbar are the artists. Give your heartfelt thanks and well-wishes to deputy director and chief curator Justine Ludwig, as she becomes executive director of New York-based Creative Time in June. We were truly lucky to have her and the impact she’s had on the Dallas Contemporary elevated the institution immensely and enriched our city at large. Read more about where she’s been and where she’s headed. The Dallas Art Fair has become one of the top art fairs in the country. This year, DAF makes it to ten— proof of their ability to bring top galleries, not just nationally but internationally, to Dallas, year after year. One of the most enduring aspects, and really, a reason why collectors should shop in Dallas year round: Dallas-based galleries always have some of the strongest shows in the fair. Although it was disappointing to not see Ro2’s perennially interesting booth included in this year’s fair as they have perennially had one of the most interesting booths, Erin Cluley, Conduit, AND NOW, Cris Worley, and Liliana Bloch should hold it down for the home team. I’m always excited to see Cernuda Art, Magenta Plains, Beatriz Esguerra, CANADA, Hosfelt Gallery, and Marlborough Gallery. As far as newcomers, I am curious to see Green Art Gallery from Dubai showing Kamrooz Aram, an Iranian artist whose solo exhibition just opened at the Modern in Fort Worth. To get the best value at the Dallas Art Fair, go for the Patron pass if you can afford it. The Preview Gala ticket is worth it as well, and one of the better parties of the year. This year you can catch a live painting performance by Japanese artist Miwa Komatsu presented by Whitestone Gallery. Skip ahead to Saturday below if you can’t make it. An exhibition called #melaninpoppin presented by WoCa Projects and Kinked Mirror spotlights emerging black women artists exploring all things #blackgirlmagic, self-love, vitality, and self-care. The show at Janette Kennedy Gallery features Taylor Barnes, Ari Edwards, Asia Youngs-Bailey, and Sanah Brown-Bowers. Anything involving Dr. Lauren Cross’ WoCa Projects is sure to be a quality show. 6-8:30 p.m.
Also in vaguely mysterious one-night openings: the adventurous curators at Culture Hole present Israel Lund’s Headless Body.Culture Hole is located underneath the Power Station; things will happen there from 10 p.m. until midnight. The Museum of Street Culture is changing how Dallas thinks about what a museum is, where it can be, and what populations it can serve. Read more about its approach and partnership with Dallas’ homeless community in this piece by Amina Khan. Tiny’s Family Life, 2003-2005, the third installation in the incremental and progressive exhibition Looking for Home: A Yearlong Focus on the Work of Mary Ellen Mark is one show you’ll see. Photography and Social Justice, featuring artworks by kids ages 11-16, is another. The opening reception from 6-8 p.m. will include a free meal and docent-led tours. Insecta Rays and a Game of Charades, an exhibition by Monique Jannette and Courtney Googe, should certainly be interesting. Googe impressed recently with kinetic paintings at Jen Maudlin for a solo show. DAY also promises a first-time performance of “The Insecta-Ray Orchestra” featuring Marco and Dave. 6-9 p.m at Mighty Fine Arts. Beefhaus is closing. As many others have rightfully lamented, the closing of the physical location is a sad occurrence for the cultural life of the city. The space cultivated many interesting artists and was a backbone of the Dallas art scene’s DIY era. The city is diminished by the loss of yet another artist-run space. There were always ghosts there, and I can’t wait to have one last Modelo in their midst. From Beefhaus, per Beefhaus: In Loving Memory: “You are cordially invited to a Memorial Event for BEEFHAUS. Proper memorial attire requested.” 7-10 p.m. The Reading Room has Carolyn Sortor’s Plied Pipes, an intermedia installation with projected HD video, text from Disney’s Frozen and Shakespeare’s Hamlet, and ambient plumbing noises. This 15-foot tunnel-shaped mirage will fill TRR for one night, exploring issues related to immigration. I had the pleasure of seeing a version of this work by Sortor in the Cedars last fall, and it will be well worth your trip to celebrate this brilliant media-based, socially-engaged artist. The show run from 8-10 p.m.
Spiderweb Salon, founded by Courtney Marie, will present a one-night show featuring the work of Daniela Cruz and performances by other members. Email the collective for a formal invitation and location info. The show runs from 7 p.m. to 11 p.m.